Amazon has announced today that its Android Appstore is now available across Europe. 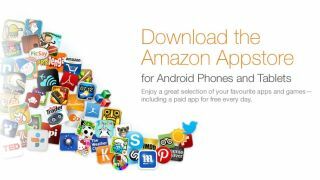 Previously only available in North America, the Amazon Appstore is now accessible from the UK, Germany, France, Italy and Spain which means many of the best European countries have been left out. No Belgium? To download it you'll need to enable the installation of apps from 'unknown sources' on your phone or tablet, and then download from the Amazon Appstore website. It's not available on Google Play, see. While most Android users will find no reason to bother with the Amazon Appstore – it offers pretty much the same Apps as Google Play – the really interesting part of this announcement is the likelihood that a European Amazon Kindle Fire launch will not be too far behind. With Amazon's next media event planned for early September, speculation is still rife that the UK and Europe will miss out on the first iteration of the Kindle Fire and skip straight on to the Kindle Fire 2. For now we'll have to wait and see - but the Amazon Appstore launch is nothing but a good sign for those hoping to get their mitts on the popular 7-inch tablet.